A protectant fungicide for the control of scab in apples and pears, containing dithianon and potassium phosphonates. Delan® products have an excellent record in crop protection since their introduction in the 1960s. The active ingredient of Delan® products – Dithianon – was discovered in 1957 in E. Merck AG laboratories in Germany. In the course of development the outstanding fungicidal power of Dithianon was observed. But the most remarkable fact about Dithianon is its permanent capability to control diseases with hİgh efficiency. Such performance is only possible for active ingredients which work on a so called multi-site mode of action. Until today only very few multi-site active ingredients are known and developed for farmers. Dithianon is one of those rare molecules that delivered more than 50 years reliable scab control to pome fruit growers. During those 50 years Dithianon was offered in various product formulations such as powders, granules or liquids. Of those, Delan® WG is the most used product amongst pome fruit growers across Europe. Other specific restrictions A minimum interval of 35 days must be observed between the last application and harvest. Spray equipment must only be used where the operator’s normal working position is within a closed cab on a tractor or on a self-propelled sprayer when making broadcast air-assisted applications. Delan® Pro contains dithianon, a quinone multi-site contact fungicide with preventative activity. It affects a wide range of fungal enzymes by reacting with thiol groups and interfering with cellular respiration. The potassium phosphonate also boosts the tree's ability to fight scab delivering protection to all parts of new and expanding leaves. Delan® Pro can be used on all apple and pear varieties and provides disease protection against scab. The active ingredient, dithianon remains in the wax layer of the leaf to form a preventative barrier. 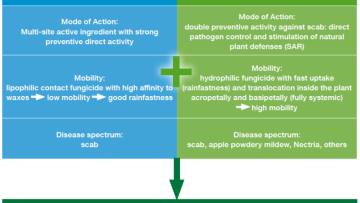 Both active ingredients dithianon and phosphonic acid both act as preventative fungicides, inhibiting early stages of spore development prior to plant infection. In the tissue of the plant, phosphonic acid also acts as an inducer of the plant’s natural defences. 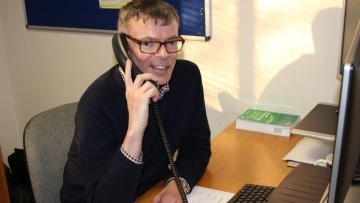 In terms of application, Delan® Pro should be applied from the start of bud burst prior to disease development and repeated at 5-10 day intervals, depending on disease pressure and seasonal weather conditions. A maximum of six applications of Delan® Pro can be made each year. Effective disease management is a critical component in delaying the build-up of resistant pathogen populations. Therefore, Delan® Pro should be applied according to the recommendations for the target disease at the rate and timing as indicated on the product label. Delan® Pro brings you synergistic effects between well known Dithianon and adds the benefits of Phosphonic Acid that translates into superior control of apple scab on fruits and leaves. 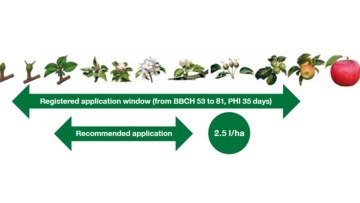 For the control of apple scab Delan® Pro is recommended from bud burst (BBCH 53: green leaf tips enclosing flowers) to beginning of ripening (BBCH 81: first appearance of cultivar-specific colour). The period during which the benefits of Delan® Pro are most pronounced is the period with strong new growth (bud burst until end of flowering). Delan® Pro is recommended preventatively with a spray interval of 5-10 days taking into account the rate of plant growth, as well as disease pressure. You can apply Delan® Pro during the period of scab infection risk reaching a maximum of 6 applications per year. The pre-harvest interval of Delan® Pro is 35 days. Dithianon has an excellent record in crop protection since its introduction in the 1960s. 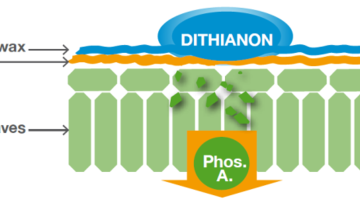 Dithianon is a highly active contact fungicide with multi-site mode of action. Dithianon disrupts the normal function of a wide range of fungal enzymes and thus interferes with several important fungal cell pathways. To name a few, it disrupts the generation of energy of fungal cells (glycolysis pathway and Krebs cycle), the protection from oxidative stress (glutathione reductase and glutathione depletion) and metabolic processes (pentose phosphate pathway). Those multiple ways of acting lead to the classification as true multi-site inhibitor. Phosphorus (P) is one of the key elements for all living species to grow. P-containing fertilizers are widely used globally in all crops. Depending on their chemical form, phosphorus compounds have very different actions in the plant. One chemical form of P named Phosphates have fertilizer properties, but lack of any fungicidal activity. 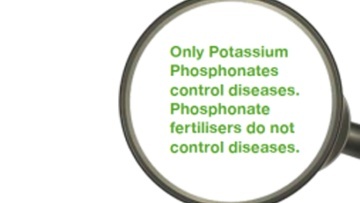 The main benefit of Phosphates is plant Nutrition. Phosphate fertilizers are mainly solid products, have low solubility in water and react strongly with the soil matrix. Phosphate is often locked in the soil and is unavailable to the plant and erodes with the soil over time. The other form of P named Phosphonates have fungicidal properties and stimulate natural plant defences but no nutrient value. Because of that fungicidal effect Potassium Phosphonates are now registered in EU as a fungicide active ingredient. Potassium phosphonates are a generator of Phosphonic Acid which is the active principle of Potassium Phosphonates. What makes Delan® Pro unique? Due to the unique combination of well known Dithianon and the systemic properties of Phosphonic Acid, Delan® Pro acts on the leaf surface as well as in the leaf tissue. Dithianon is taken up into the leaves waxy layer to form a strong preventive barrier. Phosphonic Acid intensifies the preventive activity of Dithianon by direct limitation of scab pathogens on leaf surfaces. Larger amounts of Phosphonic Acid are distributed into the leaf tissue. Once in the leaf, Phosphonic Acid is rapidly distributed in the whole plant, both acropetally and basipetally. Following this wide circulation Phosphonic Acid is able to activate the natural defence mechanisms throughout the whole plant. Delan® Pro is a new innovative water based SC formulation that is more then just a mixture of Dithianon and Potassium Phosphonates. 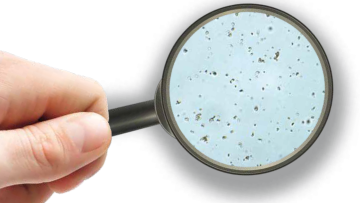 The new SC formulation of Delan® Pro contains very small particles of Dithianon suspended in aqueous phase. The Potassium Phosphonate is added to the liquid and completely dissolved for fast uptake and bio-availibility. The new Delan® Pro SC formulation goes through several milling steps in the production process. The Dithianon particle size generated by this type of milling is extremely small, much smaller than particles in WG type formulations. Further to that, Delan® Pro is more homogenous than WG products. Delan® Pro has significantly smaller particle size than many market standards and thus you benefit from superior disease control as result of a better coverage. 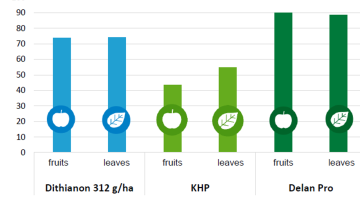 Smaller particles result in a better leaf and fruit coverage which is very important for a protectant fungicide where good coverage is crucial for effective disease prevention.